Recettear‘s dungeons are still the key to greatest wealth, whether through finding advanced kinds of armor and weapons that are not (yet) available for purchase, or through finding ingredients for crafting exotic and expensive stuff. But they’re time-consuming and risky. Adventurers never truly die in this game, but if you get sufficiently beat up, you automatically teleport back to town, and can only bring back one item. This includes items you brought into the dungeon with you. It doesn’t include the adventurer’s own equipment, mind you, but sometimes you have to pack loaner equipment, because sometimes the adventurers are slow to take advantage of your incredible offerings back at the store. One of my adventurers is level 17 by now and still using a rusty dagger, so if I want to take her adventuring, I bring a better weapon, one I crafted. I look forward to the day she actually decides to buy it: it’ll free up an inventory slot for loot, and bring a nice profit as well. But anyway, dying in the dungeon is a waste of a day, and possibly a loss of equipment as well, if you brought more than one item in. It’s probably the single biggest thing that can interfere with your ability to make your loan payments on deadline. So when it happens, you naturally revert to a previous save. (Which, naturally, you made immediately prior to delving into the dungeon.) I’ve accidentally undercharged for major items and let it slide, because little setbacks are affordable, but losing a day’s dungeoneering is too much. I think the adventurer keeps their XP for the expedition, but who cares? So I spend a fairly large fraction of my play time on this game repeating dungeons. Which is to say, wasting real time in order to save pretend time. Rushing through this game is probably not the right way to play it, but that’s what I’ve done, just to free it from the Stack. Since it’s the only game of its kind, it’s reasonably likely that I’ll go back to it at some point, to try to perfect my performance. There’s an Achievement called “Perfection” for 100% completion, and another called “Nirvana” described as “Learn to let go after attaining Perfection”, which I assume means getting 100% completion and then wiping your progress. Although it would be kind of funny, in a cruel way, if it didn’t mean that. Not that we know for sure right now. Looking at the global stats for Zen Bound 2, it seems that no one has actually achieved Perfection. Or at least, few enough that it round down to 0.0% of players. Even the achievement for getting a minimal passing grade on all the levels has been claimed by a mere 0.9%, which is oddly low for something so easy. As a point of comparison, 13.9% of players have got the “Unwinder” achievement, for using up all the rope and then reeling every inch of it back. There is no reason to do this other than for the sake of the achievement. If you want to start a puzzle over, you can just reset it. So 13.9% of the players are achievement-mongers, but only about 6.5% of those people thought it worthwhile to grab the much rarer achievement for finishing the game. What gives? I don’t think it’s likely that anyone gives up on this game because they’re stuck and unable to make progress, so people must give up on it because it isn’t to their liking. Well, okay, it’s an oddball game. To me, its mere oddballness is appealing, but the reason we see so many games rehash the same ideas is that those are the ideas that a lot of people like. But I think I can identify another reason why people wouldn’t like it: it is a fundamentally awkward game. I know I spoke in praise of its 3D rotation UI, but that’s just half the story. You control the object pretty perfectly, but you don’t control the rope, or at least not directly. You control the rope by catching it on the object. You spend a lot of time trying to nudge it off corners and into crevices, or angle it so that it doesn’t come off said corners. Sometimes you accidentally tie it off before you intend to. Very often you can’t quite see what you’re doing because the free end of the rope is on the underside. And this is a crucial part of the game’s challenge. The awkwardness of the rope isn’t a flaw in the game, it is the game. And it’s impossible to play without thinking about how much easier this would be in real life, where you could just take the object in one hand and the rope in the other for greater control. Contrast this to more mainstream games, which often go out of their way to present a fantasy of being more competent than you are in real life. I tend to downplay the role of the fantasy element in games, but I’m not just talking about the fiction, I’m talking about the interface. First-person shooters have auto-aiming. Brawlers execute complicated combos with the press of a few buttons. Guitar Hero simplifies its riffs. And in the end, what’s the result? I don’t think there can be much disagreement that you’re making the sculptures uglier with your efforts. They start off rather elegant, they end up ruined by a clumsy tangle and, unless you managed 100% coverage, a splotchy and incomplete paint job. The game does its best to pretend that it’s pretty, but it’s like a parent’s praise of an attempt at art by a toddler, which is frankly what your efforts resemble. And that’s ignoring the often-unwelcome symbolism. Many of the sculptures are representational, so there’s a sense that you’re putting animals and people into snares, making their condition worse. I suppose the game is kinder to its subjects than a more conventional game, which would just have you kill them. Still, as in Shadow of the Colossus, your goal is to take things of beauty and ruin them. But at least SotC made it difficult. Here, you wind up with an ugly mess regardless of whether you pass the level or not. Because of your clumsy awkwardness. Zen Bound 2 is a sequel to a cell phone game, and a pretty convincing argument that cell phones are where the real innovation in gaming is these days. It’s a game about wrapping things in rope. 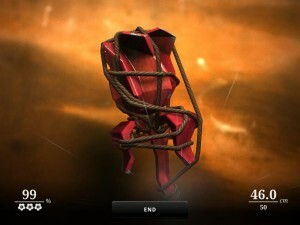 Each level gives you a small wooden sculpture with a taut rope tied to a nail in it. Purely by rotating the object, you reel the rope around it to bind as much as it can. Parts of the surface within a certain distance of contact with rope get coated in paint, which comes off if you unwind — clearly it’s not so much paint in the realistic sense as a means of visualizing your progress. Once you reach a minimum of 70% of the surface painted, you can tie the rope off at a second nail to end the level, or you can keep going for more paint and greater glory. Challenge is created by limiting the length of the rope, and through hard-to-reach concavities. Remember, you can’t just thread the rope through things; it’s always taut, and only goes into grooves if the groove is where its tension leads it. On a couple of occasions, I’ve had difficulty just reaching the final tie-off nail because of this. There are a couple of embellishments beyond this — paint bombs that cover a larger area, attached to either additional nails or to your rope — but this is a game of simple design, and getting much beyond the basics would be inelegant. The “zen” part of the title, apart from supplying a rationale for Japanese garden imagery in the menus, seems to mostly just mean that there’s no time pressure, or indeed pressure of any kind. Getting to 100% coverage on every level would be a feat (and provides an Achievement), but just getting through the minimum seems like it just requires idle fiddling. I don’t think I’ve ever seen a game more deserving of being called “casual”. It’s a simulation of toying with knick-knacks. The technology necessary for this game to exist, though, is pretty advanced. It needs a way to apply the paint texture to arbitrary portions of a surface. It needs a good physics model — usually in games that mostly means collisions, but here it means tension and friction, making the rope slide along surfaces in convincing ways. And it needs a really good UI for rotating 3D objects. Apparently the iOS version uses tilt and multitouch for this, but that’s not an option on PC. I’ve had to implement rotating things in 3D with a mouse before, and it’s surprisingly hard to get it feeling right — mainly because 3D rotations have three degrees of freedom, but your mouse has only two. Usually, as a player, I can get used to whatever scheme has been implemented, but in this game, absolute control is crucial. So it comes up with a compromise: dragging with the left mouse button pressed rotates things one way, dragging with the right button rotates things another way, and between the two schemes, everything is covered. I’ve played the game enough to internalize this, but I couldn’t tell you exactly how it works geometrically, except that the right button lets you rotate about the direction the camera is facing. I’m finding this game has a bit of a pull to it. I’ve kind of established that it’s a sort of rival in my mind to Dangerous High School Girls in Trouble, the other unconventional indie RPG with an underage female noncombatant protagonist that I’ve started playing recently, but of the two, this is the one that I feel the greater urge to play. I think the reasons are mainly superficial: it’s got brighter colors and happier music, and it’s got progress bars all over the place. Sometimes you just want to watch a progress bar fill up, you know? I’ve raised Recette (the player character) to merchant level 5, which is the point where the crafting system opens up, allowing you to combine several items into something that commands a much higher price. Crafting is simply a matter of selecting a recipe from a pre-set list. In a nice bit of UI design, the recipes you can complete with stuff in hand are highlighted, while the ones containing ingredients you’ve never even seen are grayed out. Some of the ingredients are things you can buy, others are monster-leavings that you need to pick up in dungeons. And that’s where it gets a little interesting. Dungeon-delving always takes a full day, which is time not spent selling stuff, and your carrying capacity in the dungeons is limited. So for maximal efficiency, you have to pick up only the stuff that you don’t have a lot of already. But some of the time, monster leavings are unidentified, shown only as a question mark on the screen. However, your chances of identifying a thing increase with your merchant level. This is a crucial touch for making the feedback between merchanting and adventuring go both ways. I’ve found myself thinking “I really ought to go adventuring again to pick up more stuff, but I’m almost to the next merchant level, and it’ll go a lot better if I wait”. Add to this the tactical consideration that making a trip to the wholesalers to pick up new supply is counted as taking time, but stopping by the wholesalers on the way back from the dungeons doesn’t take any time at all. Laying in a large enough stock to keep you going until your next dungeon trip can be worth it, but not if it means buying fewer big-ticket items that you can turn over for a big profit quickly. So, yeah, I’m starting to see the market side of this game as more significant, even if it is still the dungeoneering that’s taking up the majority of my time. Possibly it’s just stealthier about its less-conventional aspects than I expected, designed from the assumption that it needs to provide an ordinary RPG experience at first and easing in the details of the marketplace slowly so as to not scare people off. 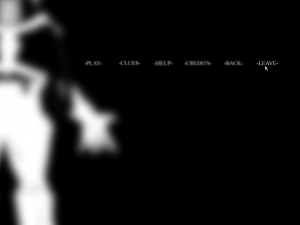 I’ve just played the very beginning of Vigil: Blood Bitterness, stopping because of problems with the cutscenes: there’s one that doesn’t play at all when it comes up in the game, and when I try to play it from the in-game play-cutscenes-again menu, the game crashes. I suspect a missing codec or somesuch. Googling, though, I mostly see people who can’t get any of the cutscenes at all to play, and most of them are playing from Windows 7 or Vista. So, I’m putting this away until I feel like figuring this out. But, having played it for about five minutes, I’m obliged to post some first impressions. I bought this as part of one of Steam’s Indie packs, but I had played a demo some time previously, and had been struck by its visual style. In fact, the visual style was the chief thing that seemed interesting about it. I’ve mentioned how Killer 7 defines shapes through shadow, but Vigil takes this even farther. Nearly everything is made of stark, sharply-defined patches of black and white, which seems to reflect the player character’s world-view. One other visual trick of note: the blurring. In UI design, an element that’s currently singled out to receive input — for example, a text input field that will receive the characters typed into the keyboard — is said to have “focus”, and elements without focus are sometimes said to be “blurred”. This game takes those notions literally: in menus, the button with focus is displayed in sharp focus, while everything else is blurred and fuzzy. It’s another neat visual trick, but on first encoutnering it, it just feels like a failure of some sort. Games in the Half-Life 2 engine have taught me that blurriness at the menu is a sign that it’s still loading and not interactive yet. I played a little more SMB. I’m still stuck in Hell, but I managed to unlock another character: Ogmo, from the Jumper series. I recall trying one of the Jumper sequels a while back, probably Jumper 3 when it was featured on Play This Thing. It seemed a decent platformer, but I wasn’t in the mood for it at the time. But hey, if there’s one thing I can use SMB for, it’s as a framework for recommendations. Seems to me I should at least try out the games that McMillen liked enough to invite to the party. So, I looked at the unlockable character roster. So far, I’ve got Ogmo, the Headcrab, Commander Video, and Jill. Ogmo I’ve mentioned; I’ve downloaded the original Jumper and played it a bit, but it gets very difficult very quickly. The Headcrab is from Half-Life. Half-Life isn’t a platformer, and the headcrab isn’t its player character, but I suppose someone wanted a Steam-exclusive unlockable, and this is the only thing in Valve’s library that’s known for jumping. At any rate, I’ve played the heck out of Half-Life (although I need to go through Half-Life 2 again at some point, now that they’ve added Achievements). Commander Video is from Bit.Trip Runner, which is a Wii game, not available on any system I own. 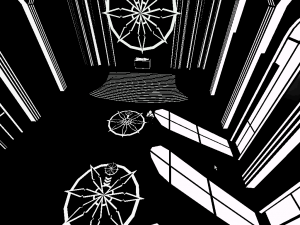 One of its predecessors, Bit.Trip Beat, is out for PC, but it looks like a fundamentally different game; if further Bit.Trips are ported, I may get them as a package, but for now, I’ll give it a miss. Looking at unlockable characters I don’t have yet, I noticed one from a game that had garnered praise but which I hadn’t tried: Runman: Race Around the World, which can be described as Sonic the Hedgehog with everything that isn’t directly related to running fast taken out, including death. Downloading that, I see it’s done in a crudely-doodled style. No surprise there — I could tell that much from the screenshots and demo video. But somehow, seeing it in-game made me look at it better, and it looked very familiar — the drawing style reminded me a lot of An Untitled Story, a Metroidvania-style platformer I had played but not finished a few months ago, concerning an egg that falls from a nest and, after fighting a few bosses, hatches into a bird that fights more bosses. It had art that was clearly drawn with magic marker. Googling, I discover that, indeed, one of the co-authors of Runman is Matt Thorson, author of An Untitled Story. Furthermore, he wrote the Jumper series, as well as a couple of other platformers I know: Give Up Robot and Moneysieze. I had played Moneysieze quite a lot last year, and meant to write it up here, but never got around to it. It struck me as fairly ingenious in its unconventional use of famliar platformer mechanics. For example, the double-jump. In many platformers, you can hit the jump button a second time at the top of your arc to gain additional height. In Moneysieze, you could perform the second jump at any point in your trajectory — which means you can use it to pass under obstacles that extend below your starting point. I thought this was clever, but now I see that the same author had already pulled tricks like this in Jumper. SMB treats the double-jump as Ogmo’s defining trait, and the warp zone where you acquire Ogmo for general use requires executing trick jumps of exactly this sort. I’m a little shocked to discover how much of Thorson’s work I’ve experienced without being aware of him. I notice now that the Play This Thing writeup of Jumper 3 actually mentions that Thorson is half of the Runman team, but apparently that fact made no impression on me at the time. Well, if part of SMB‘s mission is increased awareness of indie platformers, mission accomplished. I considered myself pretty aware already, but it looks like I wasn’t aware of my lack of awareness. I’ll be watching for Thorson’s name in the future. Also, for what it’s worth, Runman‘s level-selection screen plays a recording of Helen Humes singing Song of the Wanderer, the same background music as the level-selection screen for Immortal Defense. I suppose there are only so many public-domain jazz recordings out there, and Runman uses many of them, but unless this is a deliberate reference, it’s a strange coincidence. Or maybe there’s just something about that song that suggests “level select screen” to indie developers? I’m definitely going to use it for that purpose if I ever write a game with a level-select screen. It’s too good an in-joke not to share. I remember playing a demo of Dangerous High School Girls in Trouble a few years ago, when it wasn’t in its final form yet. It was clear that this was a game worth watching for, but only now that I’ve been gifted a copy am I starting to play it for real. DHSGiT has been described as a game that’s difficult to describe. It adopts the style of a vintage board game, but mechanically, it’s more of an RPG. Just not the usual sort of RPG for a computer game: there’s no combat, or at least no physical combat. There are Monkey Island-style insult duels, though, as well as a few other kinds of abstracted confrontation: you sometimes have the option to tell lies or expose secrets or flirt by means of other special mini-game mechanics, aided by your character stats in various ways. I’ll go into details in a future post. For now, let me note just a couple of things. First, these mini-games are no more or less abstract than typical dice-based RPG combat. Your stats represent attributes relevant to stories about a teenage girls in the 1920s: popularity, rebellion, glamour, savvy. The stats are applied simply as numbers, but in ways that make stats more or less relevant to certain kinds of conflict, as appropriate. For example, in a taunting-match, your popularity rating is used like hit points, which stands to reason: the more popular you are, the more abuse your reputation can stand. Second, the stats chosen seem more narrative than simulationist, aspects of character rather than physical attributes, chosen for their importance to the story rather than for their practicality in themselves. They remind me a lot of the special-purpose narrativist stats found in alternative pen-and-paper RPGs, or the “storytelling games” that they’ve developed into. One of my favorite examples: in Paul Czege’s My Life with Master, the player character stats are Love, Weariness, and Self-Loathing. The more freeform storytelling games take this a step further by letting players make up their own attributes, but you pretty much need a human adjudicator for that sort of thing. The point is, the RPG has branched out from its wargaming origins, but the CRPG has largely been content to stick close to D&D-ville, regardless of setting or genre. DHSGiT is a glimpse of what else is possible. It really shows just how conventional Recettear is, despite its pretensions. The high concept of Recettear: An Item Shop’s Tale is that it’s a typical JRPG told from a different perspective, that of the owner of the shop where the heroes buy their equipment and sell their loot. You could also describe it as a small business sim set in an RPG world, but on the basis of what I’ve seen so far, I’d call that description less accurate. This is a game that fits very securely into the JRPG genre, and possibly even better into the Japanese “visual novel” genre. For one thing, it’s so Japanese that the voice acting — which there isn’t a lot of — isn’t translated. The characters are all perfect examples of anime stereotypes (the childish but warm-hearted heroine, the bookish bespectacled friend, the haughty yet ridiculous rival, etc.) And, like a visual novel, there’s lots of scripted, barely-interactive or even non-interactive dialogue — too much, if you ask me. There are lengthy tutorials for things that are self-explanatory. And the basic mechanics involve choosing what to do with your time each day — time is of the essence, because you have to make weekly payments on a large debt — by selecting destinations on a town map, some of which will sometimes trigger cutscenes, all of which, if I understand correctly from my very limited experience, is standard visual novel stuff. There are two chief practical reasons to go into town: to buy stuff to sell in your shop, or to hire an adventurer to take you out to loot a dungeon. Now, I’m not very far advanced in the game, but so far, it seems to me like the dungeons are generally the key to profit, because you find reasonably expensive stuff for free there. Dungeons are a fairly simple Diablo-like action-RPG business in which you control the adventurer you hired rather than the shopkeeper, who basically tags along just for the sake of narrative unity. This is a whole largish aspect of the game that doesn’t fit into the business sim model at all. And when you get your stuff back to your shop, what do you do with it? You put it out on display, and customers come to haggle with you over it. Haggling is far from a universal feature of RPGs, and very seldom such a core element of gameplay as it is here, but still, it’s something I’ve seen done in RPGs more often than in business sims. I understand that there are more advanced mechanics unlocked as you raise your merchant level — the shopkeeper gets experience points by selling stuff — but at the moment, the basic mechanics are all fairly ordinary RPG stuff with slightly different emphasis and explanation. Fittingly, Hell seems to be the place where the difficulty ratchets up to just beyond my abilities. I may well change my mind about this — a good platformer makes things seem like they’re beyond your abilities but then trains you up to the point where they’re not. I remember Crash Bandicoot as being particularly good about putting collectibles in seemingly-impossible places that I skipped over on the first pass but came back for later with greater confidence. The “Veni Vidi Vici” sequence in VVVVVV looked daunting at first, but yielded to persistent practice. Still, those are both matters of hunting for optional collectibles. Here in SMB it’s the main path through the game, and I’m not even on the last world yet. I’m winding up doing the opposite of what I did in Crash and VVVVVV: going back to find collectibles and bonus areas because it’s the easier alternative. Well, I knew what I was getting into when I started playing. This game has a reputation for extreme difficulty. I’ve seen this school of game design described as “masocore”, although there are differing definitions of that — the author of Super Jill Off contends that a true masocore game has to subvert genre expectations. I suppose SMB does that to some extent, though. Just the sheer abnormal distance that you can leap is something of a subversion, in that it allows the designers to create levels where the best and safest route through a series of obstacles is to just clear them all in one go. As you’re no doubt already aware if you’re the sort of person who reads blogs like this one, Wolfire Games organized a second “Humble Indie Bundle” this holiday season, a collection of indie games offered on a pay-what-you-want basis for charity. This has served as a reminder that I still haven’t played everything from the first Humble Indie Bundle, which I purchased just before this year’s chronological rundown. So, let’s start to take care of that. Samorost 2 is the sequel to the free web-based Flash adventure game Samorost, and has a lot in common with it. Both games are basically click-and-wiggle affairs like Windosill, things where your the results of your actions aren’t very predictable and you just have to poke at things and observe the effects until you figure out how to poke at them in the right order, or with the right timing, or whatever is necessary. The Samorost setting is a bizarre little world, consisting of highly-detailed asteroids that look like they’re made of decaying tree bark and similar materials, populated by a collage of cartoon, photograph, and things in between. Interesting art, good music, lots of things that react to you — although perhaps not enough to really satisfy. 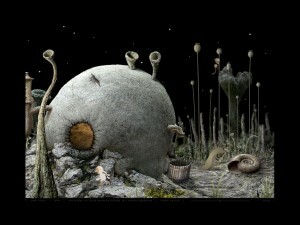 The original Samorost was quite short, consisting of a mere six screens worth of random-ish environmental puzzlery. The sequel is quite a bit larger, but it’s still a one-sitting game, unless you miss a hotspot and get stuck. That’s altogether likely to happen, though; I had to consult a walkthrough at one point to unstick myself, and it was of course because of a hotspot I missed. This is the sort of game where you have to wave the cursor around a lot to distinguish clickable details from non-clickable details, and sometimes the clickability of something changes in response to your actions.